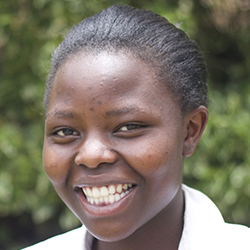 Eunice will graduate from Uhuru Academy in 2017. She is from Maai Mahiu and lives with her Grandmother, Rosemary. She has been inspired to be a pilot ever since she was little. Eunice enjoys encouraging others when they are down, and sharing the love of Christ with them. She also enjoys being a leader and hopes to run for President of the Student Council next year. At Uhuru Academy, she loves the friendly teachers and students. They are ready to help people in any way. She says the education at Uhuru is good quality compared to other schools she has attended in the past. Through education, she is building up her future and hoping to change her family’s situation through her career. She wants to become something better by completing her goals. Click here to donate to a student like Eunice.